So on a Wednesday morning at 9:51, my sister, the girls and me boarded the Metra heading to Union Station. The train station is only a block away from Willis Tower, which was fortunate for us because the wind was whipping off the Chicago River and it was COLD! We had to wait in line to go through security first, just like at the airport. I wasn’t expecting that, but it makes sense. After we bought our tickets, we took the minute ride elevator to the 103rd floor. It may have been cold outside, but the sun was shining and we had a beautiful view! A new feature of the 103rd floor are the ledges; four glass platforms that extend out of the west side of the building. Lily was enthralled with looking by looking out at the Chicago skyline, and she didn’t want to take the elevator ride down to ground level. But eventually, we had to leave. By that time, we were all starving. Just down the street from Willis Tower is Giordano’s. When you are in Chicago, you have to have a Chicago stuffed pizza! My sister lives in California, so we made sure to feed her a lot of Chicago-style food during her visit. Where would you go or what would you do if you had a “stay-cation?” Link up your blog post below or tell us in the comments! Please visit my co-host, Gretchen, and see where she would go on a stay-cation. She live in a much warmer place, so I’m sure it’s going to be good! Don’t forget to stop by Second Blooming or here on Monday for next week’s prompt! Wow! The tower looks amazing, and I felt a bit scared right there! LOL. The pizza looks yummy too! I’d love to go on vacation in Paris or London. 🙂 A girl can dream you know! Hah! I’ve never been to Paris or London. Maybe someday! How wonderful you were able to visit with your sister this week. The ledges would be a challenge for me but Hubby would so be standing in them! So pleased for you that you had a terrific staycation! We always enjoy my sister’s visits! Even though she likes to see me, she loves to visit her nieces the most! And I bet your girls love Auntie to visit, too. Good times, great memories. I did not know the Sears Tower’s name was changed. 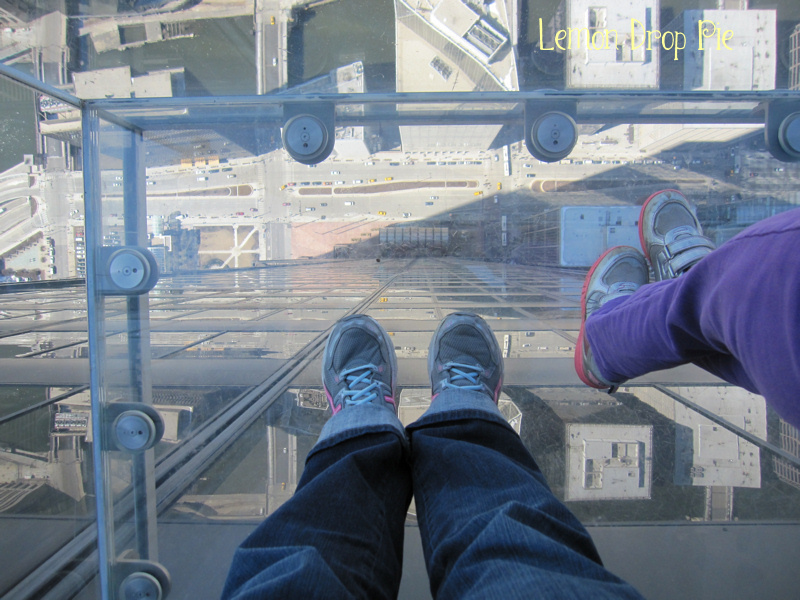 You are braver than I… my tummy did a whole bunch of flip flops looking at the pictures with the glass platforms! One of these days we will have to take a trip there… it’s not really that far away. Jeanne recently posted…A Sign Of Spring? That’s true…you are not that far away! Most of us who live here still call it the Sears Tower. 😉 That will probably never change! Funny, I live in Chi-Town, worked downtown and take visitors to the Sears but never been upstairs. I need to get there. Your pictures make it look amazing after the renovation a few years ago. I hear you can see 4 states on a good clear day. Ha, ha. Yes the state lines are clearer on a map. Oh dear Lord, I just took one look at those pictures and went into a full body cringe. I couldn’t even look at them, had to scroll down to the pizza! You are brave, my dear. Jude has forced me to the top of the Empire State twice,and that was terrible enough, but the glass floor? EEEEEEEEEK! Okay, now the pictures are even freaking me out! It didn’t feel scary to me when I was actually in the little ledges. They don’t extend out of the building by much. But I wouldn’t recommend you take Jude up there, or he’ll force you to go on a ledge! OMG Ginny I hate heights and that picture you took nearly made me faint from here! I couldn’t do it not in a million years! Good for you guys that it doesn’t freak you out because it looks like a great view! I love pizza however and I always wanted to try real Chicago style pizza! Chicago style pizza is the best! The one bad thing about it…it takes a long time to bake! We ordered the little individual pizzas for lunch, so there wasn’t much wait time, which was good. We were starving! Hello there! Stopping by from #Sitssharefest! Spring break for us is this week and we’re doing a Staycation too. We plan on visiting Chicago this summer and checking out the aquarium. 🙂 I haven’t been to the Sears Tower since I graduated from high school! Eons ago! We might have to stop by there again too! The Shedd Aquarium is awesome! We’ve gone a couple of time in the past two years, and have always had a great time. You have to go to the dolphin show! I will definitely put the dolphin show on our list! Thanks for the info! The Willis Tower?!? Puh-lease! It has been and always will be the Sears Tower. End of story. 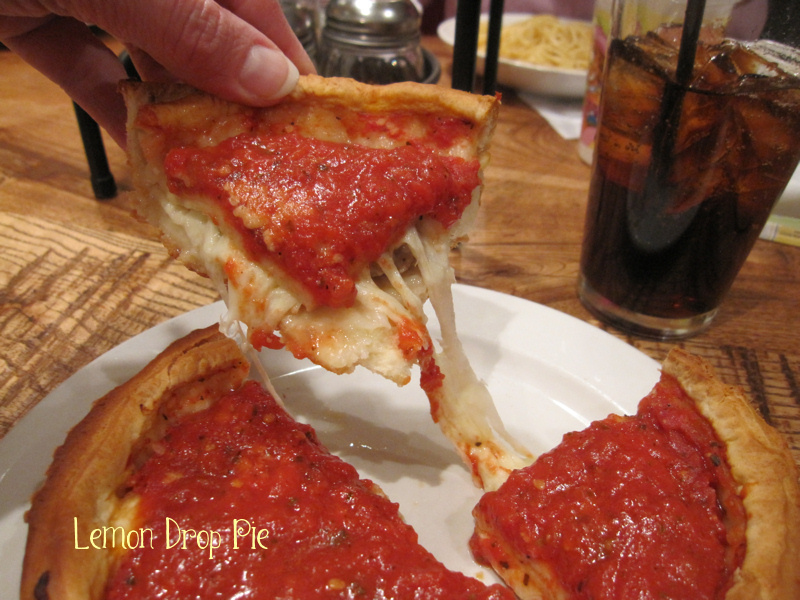 Oh my mouth is drooling over the Giordano’s. That picture is spectacular. I agree! I have been calling it the Sears Tower, and I will never stop! LOL! Oh, that pizza looks so yummy! Totally not getting me on a glass floor though…. Hope you had a great spring break!! The glass floor wasn’t as bad as it looks! It felt just like the real floor! I love stay cations in chicago! We try to do one at least once a year, but we haven’t been to the top of the sears tower in a long time. Yes, I still call it the sears tower! 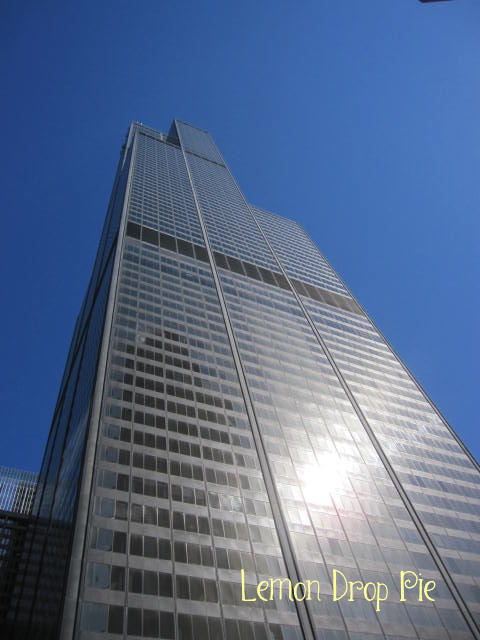 It will always be the Sears Tower to me! I can’t remember the last time I went up to the top. It’s been years, so it was fun to see the new ledges! Obviously when we lived in Illinois we loved the city and went to Gino’s all the time for their deep dish pizza. (I just received my box of six Lou Malnati’s deep dish pizzas this week from Taste of Chicago) However I think some of my favorite times in downtown Chicago have been since we moved to California. We take so much for granted when we live close by. 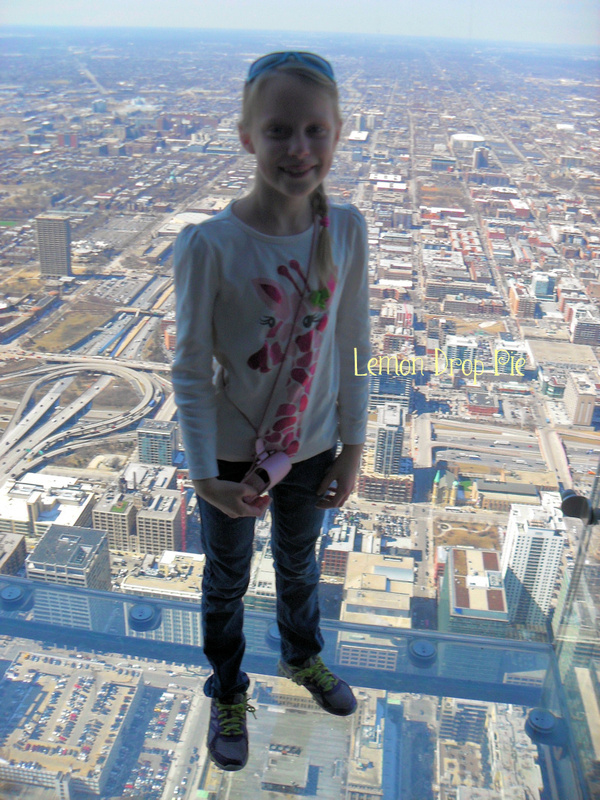 We did the Willis Tower on our last visit and the views are so amazing. Chicago is a great city!!! I’m so glad you took the girls and that your sister got to have some awesome pizza since there is nothing ever remotely close to Chicago pizza in California. We always hit our favorites, thick and thin, when we are in Illinois. Deborah Pucci recently posted…YOU CAN DO ANYTHING YOU SET YOUR MIND TO……. Oh, I love Malnati’s pizza so much! Fortunately we have one close to us so we can order it whenever we want to! We can’t even find good pizza in Iowa when we visit family, and that’s a lot closer than California! Your so lucky. We didn’t know about Lou’s when we lived in Illinois but learned about them a few years ago from Mark’s brother. They have the best system for mailing and the frozen pizza cooks up beautifully. It’s not the Sears Tower anymore??! What?? I’m about 1.5 hours from Boston, as well as Albany, and the Connecticut seashore. I’m about three hours away from NYC. Those are all staycation ideas for us. tamaralikecamera recently posted…All The Good Stuff Happens On Twitter. I’ve been to Boston once, and it was a lot of fun! It sounds like you have a lot of fun places to visit! My sister was just in NYC. I’d like to go there again. I was in college when I was last there! 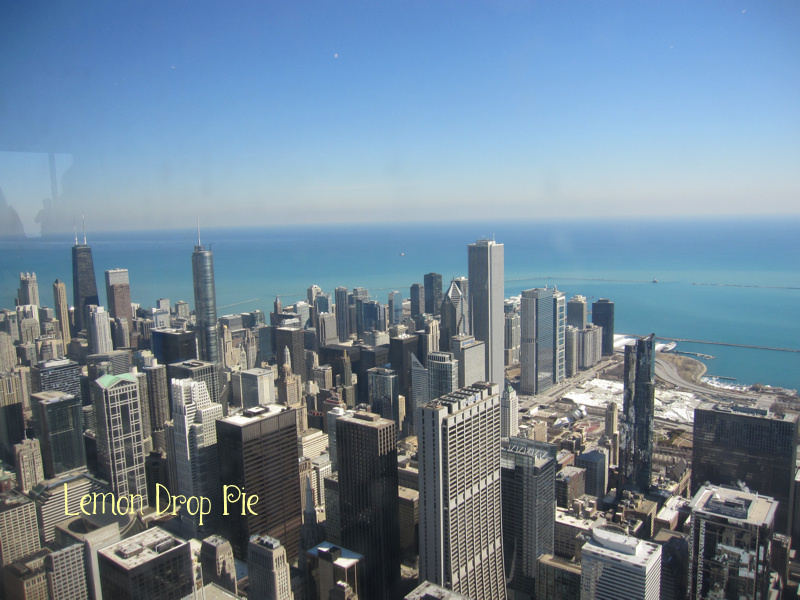 We marveled at the tower when we came though Chicago on our way to Michigan. We went by train and it was cool for the boys to be able to see the tower. We would like to come to Chicago some day and do the touristy stuff. VandyJ recently posted…Woot! Woot! Friday! Chicago is a fun city to visit! We have a lot of neat museums. I need to play tourist in Chicago more often! The train conductor asked us if we were going to the American Girl Store! Maybe some day we will, but that’s a trip that has to be planned in advance. There’s a neat lunch to take your dolls to, but I think you need to make reservations way in advance. My girls would really love to do that!